In 2018 agreements were reached to explore the development of links between the large Parish of Clarendon and Gwynedd in North Wales, as well as the neighbouring counties that have historical connections with Wales. In Sept 2016, Mayor of Clarendon, Cllr Scean Barnswell, welcomed members of the delegation to his office in May Pen. This is the only Mayoral Office in Jamaica’s large Parish of Clarendon, which is equivalent in size and population to North West Wales, and has areas with the strongest historical links to North Wales. The Parish of Clarendon hosts the annual Jamaica Agricultural Show, known as the “Denbigh Show” in the town of Denbigh, which was one of the plantations owned by the North Wales family of Pennants, the former owners of Penrhyn Castle, Bangor. Most of the plantations that contributed to the enormous wealth that the Pennant family in North Wales were also in the Parish of Clarendon, with a clear legacy left in the name of a small village named Pennants in the North of the Parish. Recent work has focussed on the development heritage tourism and there is interest to link with heritage agencies in North Wales. The Jamaica Agricultural Society sent an invitation to the Denbigh and Flint Show team in Denbigh and the Young Farmers in Wales to visit the Denbigh Show in Jamaica, plans are in hand now to visit in August 2019. 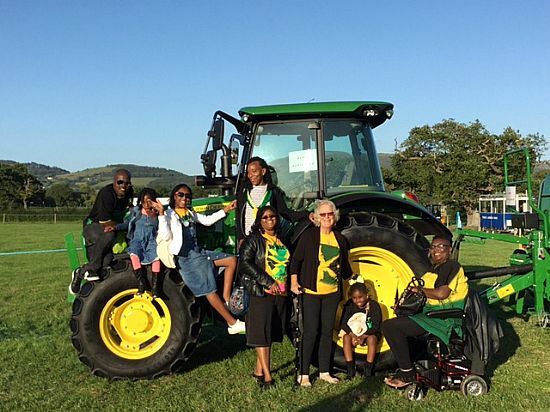 A delegation of Jamaicans based in UK were invited to attend the Denbigh and Flint Show in August 2017 and a great time was had by all!